An affordable guitar with a lot of potential. Well worth paying extra for the pickup. Lively resonant tones. Strong midrange. Great intonation all the way up the fretboard. Some setup issues out of the box. You can tell that Seagull guitars hail from the Godin stable. It's a very different manufacturing style to many others out there. For example, there's a lightness of build to them and an airy resonance, a character that has a whiff of the classic early Gibsons: a stark contrast to many over-built, Asian-produced designs that dominate the lower/mid-price markets. A very encouraging start. 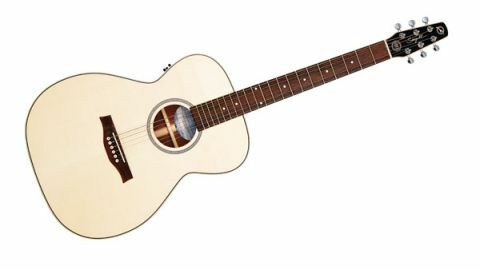 Our review acoustic is classified as 'Concert Hall', Godin's take on the classic Martin 000/OM 'medium' body, but slightly squarer at the shoulder and at the bottom than some of this style. Dimensionally, things are pretty similar to the Martin 000/OM blueprint, albeit trimmer across the lower bouts, very slightly bigger in depth with a similar taper to the sides. "All binding and purfling is sharply executed and there's a neat herringbone back stripe and rosette"
It displays what an increasing number of us appreciate about the OM-style: a sort of halfway house, all-rounder feel that sits between the smaller parlours or 00's and larger dreadnoughts of the acoustic world. The top is 'pressure-tested' solid spruce and is constructed with a compound curve. This light arching is found on virtually all steel-strings, and Godin's subtly different recipe aims to increase structural integrity, allowing the top to be thinner and more lightly braced. The bracing itself is Adirondack or red spruce - known for a more 'dynamic' character compared with Sitka spruce - which should result in an impressively lively top. There's an 'Integrated Set Neck' said to work in conjunction with the compound curves of the top to eliminate downward pressure from the fingerboard onto the top. It simultaneously reduces any tendency the neck may have to twist or warp over the years. Maple dowels have been inserted into the base of the heel of the neck, which Godin believes makes the neck several times stronger. Our Seagull uses solid mahogany for neck, back and sides. All binding and purfling is sharply executed and there's a neat herringbone back stripe and rosette. The fingerboard is rosewood as is the calm, unfussy bridge. The nut and compensated saddle are Tusq, a nod to the modern, while the finish is a thin satin coating, which we certainly prefer over thicker, heavier gloss finishes. Does it affect the guitar's tone? Well, even on first strum, you can't miss that lively resonance. The tapered headstock of this longer-scaled Seagull, meanwhile, gives a straighter string pull, designed for easier tuning and to minimise potential neck twist. "This Seagull is a folkie's delight. Its tone has a strong midrange, great for the fingerpicker"
This Seagull is a folkie's delight. Its tone has a strong midrange, great for the fingerpicker. We weren't expecting the low end of a dreadnought, and fresh out of the case the tone is starchy, unforgiving and rather thin. Pulling the neck forward a hair (increasing the relief ) via the two-way truss rod restored some of the missing heft and cleared up the fretbuzz that our open tunings had exposed. As the strings lose their newness, the tone develops a dry, breathy, almost papery character, particularly noticeable when strumming with a pick. This is not a loud guitar; the tone is not at its best given the strong arm either, but the balance and dynamics are impressive. The neck has a fairly shallow C profile, again with the satin finish, and - diverse as our playing styles are - both of your writers felt very comfortable with it. There's top quality fretwork with sweet intonation all the way up the fingerboard, which results in trouble-free capo'ing and drop tuning. For an extra £100, as here, you can get the Godin Q1T pickup system factory-fitted. It uses a simple under-saddle pickup, which delivers a strong signal true to the guitar's character, and has a built-in tuner. It compensates for the underpowered bass end, too: it's worth the extra outlay. All in all, it's great value for the money, rising above a market crowded with 'me-too' solid wood guitars that often lack that certain something when in the hand. For guitarists with a lighter touch this is a must try - after seeking it out you may very well conclude it's a must-buy!